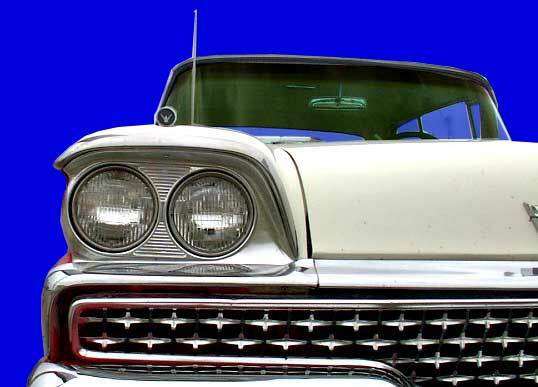 In the nineteen fifties the buoyant economy and the seemingly infinite expectation of the public resulted in auto makers churning out almost new design each year. 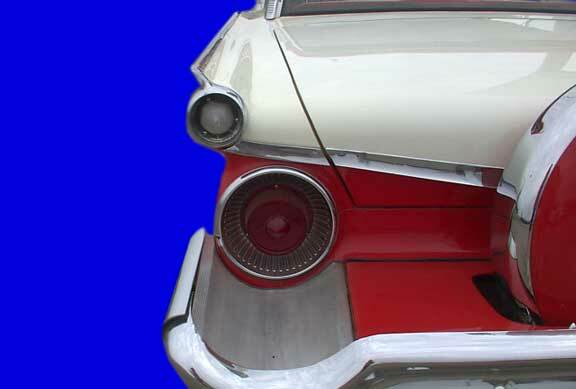 In 1957 Ford brought out a dramatically reshaped vehicle over its fifty-five and fifty-six vehicles and introduced an interesting idea of having the hood open from the windshield forward. Then in fifty-eight the design was refined and made quite attractive in a smooth four head light arrangement and large horizontal tail lights. The fifty-eight was a compact design and seemed similar to the new and somewhat upscale Edsel that was introduced in late fifty-seven but was doing poorly. The fifty-nine was larger, the body was longer and had a fresh look departing from the rounded appearance of the fifty-eight. 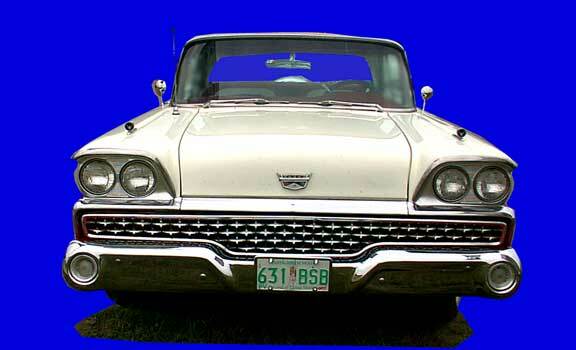 Ford was trying to create its own design trend as GM had followed Chrysler with huge tale fines in its fifty-nine design while Ford worked on a look of its own with the hint of jet engine exhausts in its large round tail lights. 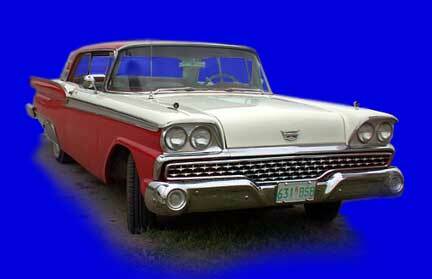 Ford had two elegant cars on lots and all cars in their fleet were influenced by them. 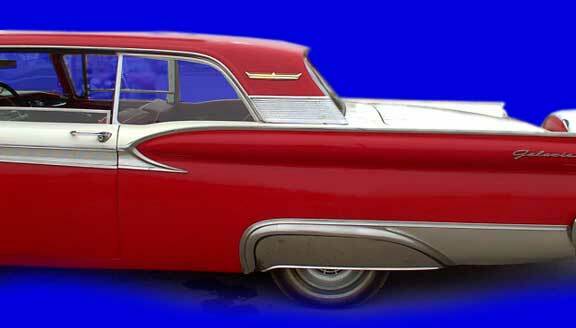 The horse collar Edsel and the smooth almost romantic looking Thunderbird. 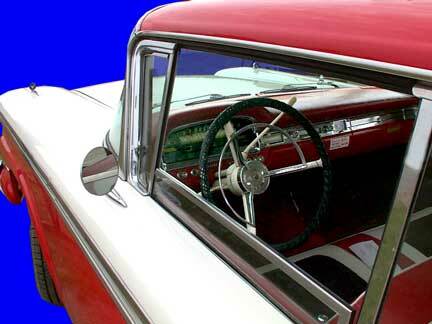 the sixty and sixty-one Mercury and Monarchs where the back window actually slanted back toward the cabin of the car and on luxury models was and electric powered openable window. because of their extreme body roll from the all four coil springs. In general the fifty-eight and fifty-nine Fords were remarkably crash worth. The Ford power train of this era was interesting, they had an outstanding automatic transmission and you could buy the car with an eight or six cylinder engine. This beautiful hard top is equipped with a V-8 but my father had a sedan with the six cylinder engine and it was economical and the six had lots of power. However, the six cylinder sedan lacked the front end weight of the eight cylinder model and was extremely light on the front wheels given to leave the ground on hitting snow drifts and popping over sharp hills. This show model has been fitted with a "custom" built continental kit made by a jobber in Kelowna B.C. 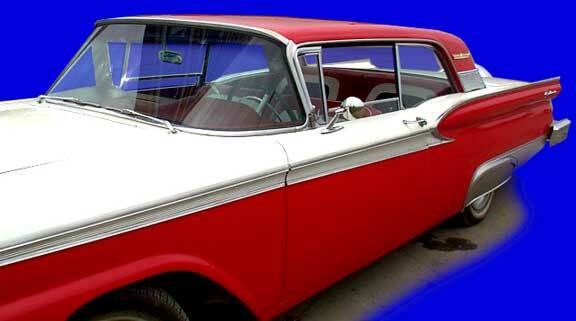 The fifties were a time for owners to add things like this continental kit and Ford even had one of its own. Owners would add extended exhaust systems and in fifty-nine a car like this one definitely would be seen cruising with a raccoon tail on the antenna.